The last time GALO Magazine spoke with Brooklyn artist Oliver Warden, he was between two worlds: the virtual world of video game-based art and the reality of art world skeptics. Now, little more than a year since, his newest artistic endeavor seems to be the world itself, best described as global, or as Warden aptly calls it, GLOBALL. Unprecedented in both its scope and origins, Warden’s most ambitious project to date is summarized by a single question, “Can we pass seven beautifully made wooden balls, hand to hand, person to person, around the world?” In keeping with a hallmark of Warden’s body of work, GLOBALL challenges both the form and function of its medium, or as Warden explained last September, “I want to destroy your idea of what art is; it’s my lifelong ambition.” Put simply, GLOBALL is a social network composed of people among whom seven wood-crafted balls are exchanged indefinitely. Put less simply, GLOBALL engages relationship forming as an art form. In a similar vain to the so-called, “art of living,” GLOBALL challenges people to enact the “art of connecting” — in a time when social connection is as accessible and instant as ever online, GLOBALL is a decidedly contrarian effort to revitalize relationships founded in the traditional custom of exchanging a gift. GLOBALL’s innovation is in how the gifts are uniform and self-consciously a part of a larger network. Fundamental to any of Warden’s work is how it is distinctively illusory — a simple plan surrounding complex ideas. Relying on the most basic definition of art as a means of communication, GLOBALL explores how a social network is a means of communication in and of itself. 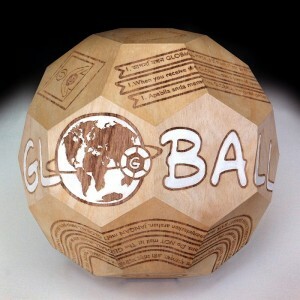 Not surprisingly, the novelty of such an idea as visionary as GLOBALL has quickly garnered a variety of media attention, including a recent interview from Amanda Browder at Bad at Sports, as well as ArtInfo. In order to engineer the Web site and the balls — made from wood that is to be sourced from all seven continents — Warden is hoping to raise $20,000 through an Indiegogo campaign, which ends on November 26th. If all goes according to plan, Warden will be hosting a launch party in New York City — a tight-knit group of only friends, from which he’ll hand off the balls — in late January, early February. Ever since the first grade, when he memorably created a one-point perspective drawing at the age of five, Warden has dedicated himself to crafting wholly visionary causes. And his extraordinary ability to see something for what it is as much as for what it could be through art is no more self-evident than in hearing him explain GLOBALL. GALO: It can be said that GLOBALL involves a kind of performance art, and it is certainly interactive, yet it is markedly different from what you’ve done before. How and when did the idea for this project come about? Oliver Warden: I don’t know, because GLOBALL, unlike all my other ideas, didn’t have a Eureka moment, or at least I can’t remember what it is [if there was one]. But instead, it was a combination of all these things in my life coming together at a certain time. Around 2008, the recession hits; I’m still going on [President] Barack Obama’s hope, still optimistic, I’m coming off a project that is very dark — a Columbine themed feature-length film based off a video game — and I think GLOBALL is the opposite of that. It’s hopeful and optimistic. I was having tough times in my personal life. And I saw this weird moment in 2008, when Facebook was awesome, but there was starting to be something missing. And I think what it was, was deep, meaningful content and connection. There is another level of connection that I think social networking can offer. GALO: Because the connections are based on exchanging a tangible object, GLOBALL sounds like a drastic departure from your allegiance to the virtual. Is this a criticism of virtual connection? OW: It’s not a statement. I don’t have any problem with fully virtual. In fact, when people say, “oh, I hate Facebook,” my knee-jerk reaction is often to think they don’t do it enough. Rather than abandon it, why not push through it so deeply that from the other end comes art? You know, for an artist, comes art. I’m 42-years-old; I have one foot in both digital and analog. I’m very young in the sense that I’m fully immersed in the virtual, but I’m also very much a product of my age, growing up rooted in analog. So, GLOBALL is a fitting union of the two that challenges those of us from an analog age, just as much as those who grew up only knowing digital. GALO: How can attempting to form a social network be considered an artistic endeavor? OW: It’s a new type of social network. It’s a work of art where social networking is my medium. I like to say it’s in the collective experience — what it creates ultimately, as one giant endeavor. Facebook could have solely been a creative endeavor; it could’ve been art. I think the best thing is I don’t know how it will truly manifest itself. The only way to find out is to do it. You can track the GLOBALLS on the Web site. And as each GLOBALL travels from person to person, it will give people a chance to take a one-of-a-kind work of art and instead of keeping it, pass it to the person of their choice. As GLOBALLS travel around the world, the Web site collects their fantastic stories. It’s a medium of contemporary art, but it’s hard to pin down exactly wherein the art lies. It’s not solely in the balls; it’s not solely in the storytelling. GALO: How is exchanging GLOBALLS a distinctly more meaningful kind of exchange compared to other forms of gift giving? OW: I want people to think about whom they’re going to hand the balls to. Because you can’t mail the balls, it will create a more meaningful connection between people. It can be anyone, but it requires meeting face-to-face to pass it on. As people share the GLOBALLS, they can take a moment to define on their own terms, words such as “share” and “friend” and “follow.” It is said that giving a gift to someone is really giving a gift to yourself. GLOBALL expands on this notion by providing you with the chance to give someone not only a GLOBALL, but also the gift of giving itself. The GLOBALLS are a part of a larger network, and to be a part of something distinguished makes receiving one a special thing. GALO: Aside from the obvious pun, what is the significance of having the object of exchange be wooden balls? OW: The balls are made out of wood for a very particular reason. Wood is a natural palimpsest — an object that can record its history within itself. When people touch them, the oil from your hands will rub off onto the balls and create an analog history woven into it, which, in a sense, is the history of its social network. It’s recording its own social connections. The record will be reflected digitally online on the Web site, and over time you can see the balls’ appearance change. They’ll increase in substance, with their value based in the experiences associated with the ball. You can always talk to that friend with whom you shared the GLOBALL. It involves consequence and, in turn, a more meaningful exchange than just what you might experience through a purely virtual connection. GALO: Compared to your previous works, there seems to be a large risk for failure, since the artwork is not in your control. What happens if a GLOBALL is destroyed or lost? OW: I’m sure that’ll happen. That’s part of the experience, but I hope that if someone decides to destroy a GLOBALL that his or her idea is better than mine. There might be a reason to do that. The piece requires a lot of faith in people, but I think that’s fresh and exciting. The art is in the process, as much as it is in the resulting network. GALO: To what end is GLOBALL intended to exist, since the GLOBALLS are to be exchanged indefinitely. OW: Nothing would make me happier than to be in a pub in Dublin nine years from now and see a GLOBALL being passed to someone. Hopefully, it’ll endure as a testament to the human spirit, and how the human spirit, in one way or another, will always manage to communicate. GALO: GLOBALL is simultaneously substituting virtual connection with actual real-world connections, but also uses a virtual forum to maintain a sense of the GLOBALL network. How does this combination relate to your pre-existing artistic practice? OW: I’ve been in the New York art scene for 20 years. And one of the ways to make a living is to show in galleries, and for a long time I was making the kind of work that can show in galleries. I was in some fantastic group shows, but I never had a solo show or the representation I wanted here in New York. After the recession hit, 20 percent of the galleries in Chelsea closed, including the one in Boston that was representing me. And I realized that the stability and the foundation that we think is so enduring and strong is actually a façade. And that includes the gallery system, and that even if you have representation it doesn’t promise you a career or the rich experiences you expect. Meeting the right people at the right time, you can’t plan. Timing is everything. So, I started thinking outside of the gallery system. I was rejected enough times to start to think of other places to make art. The Internet allows for instant connection to everyone, all the time. And I realized the world can be our gallery. Once I started thinking outside of commodity-oriented art, it started feeling more authentic. I started seeing galleries more as stores, less as churches — places of worship — and I started thinking (thanks to the Internet) that I have a chance to communicate with everybody at once. It feels like a responsibility, as a contemporary artist I need to address the world. What message do I want to send the world? Well, there’s sharing, connection, gifting, fun and friendship. I needed a positive message in my life. It’s very difficult to have this level of faith in people, but it seems like time well spent. To learn more about GLOBALL, please visit the official Web site. If you wish to donate toward the Indiegogo campaign, please click here. The campaign ends on November 26, 2013. Video Courtesy of Oliver Warden.